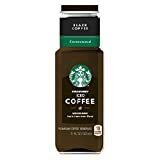 Starbucks Classics Caffe Mocha Iced Coffee is a prepackaged iced coffee sold in grocery stores. (This used to be called "Starbucks Discoveries"). It is sold in a 48 fl oz bottle and there are six, 8 fl.oz. servings per carton. Each serving would contain 85mg of caffeine. We listed the whole carton amount as a warning for those that may want to drink all 48 fl oz fluid ounces in one sitting or in one day. This would exceed the recommend max dose of 400mg of caffeine in one day. 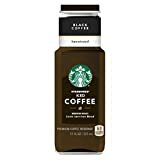 Starbucks Classics Iced Coffee is also available in Vanilla Latte and Caramel Macchiato flavors, which also have the same caffeine content. Sugar content: 126 grams (per 48 ounces). How Does Starbucks Classics Caffe Mocha Compare? 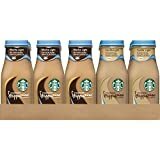 Starbucks Classics Caffe Mocha contains 10.62 mgs of caffeine per fluid ounce (35.93mg/100 ml).